From the Industrial revolution and onward, the world has become an environment that is overflowing with dangerous toxins. Mass manufacturing has resulted in thousands of chemical pollutants being released in the atmosphere, water, and soil. As well, there has been a widespread increase of chemicals being added to almost every type of food and retail product. With this overwhelming chemical exposure, there has been an increase in research and studies showing the life threatening impacts on our health and well being. 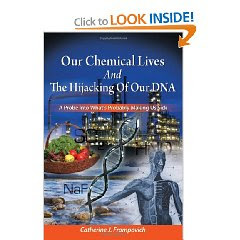 In her book, ‘Our Chemical Lives and The Hijacking of our DNA,’ author Catherine J Frompovich, delves into the effects of a chemical laden world on the body at a cellular level. ‘Our Chemical Lives and the Hijacking of our DNA’ is an important “wake up call’ about the current and future state of our toxic environment and what will happen if important changes are not made. Not only is it highly educational, the attention to detail makes the book a handy health resource tool. It is highly recommended to not just mass readers, but also to politicians, manufacturing industry officials, and health professionals.